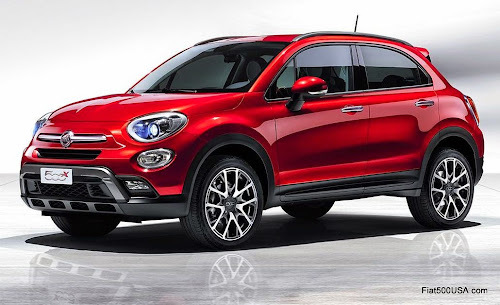 With the Fiat 500X about to make its debut at the Los Angeles Auto Show next week, Fiat in Europe has released more details on this exciting crossover utility. 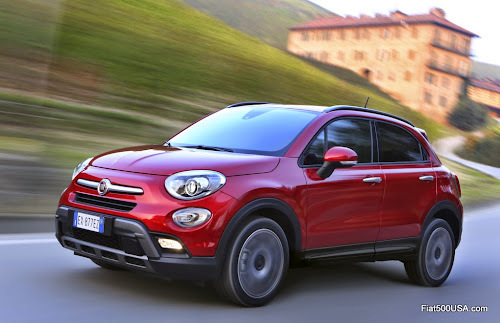 Below is the full press release on the Fiat 500X to help get you up to speed. 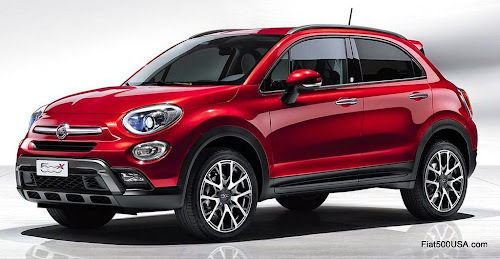 You will be an expert on the Fiat 500X by the time you are done! Keep in mind, this is for the European model, so equipment, engines and other details are expected to be different. 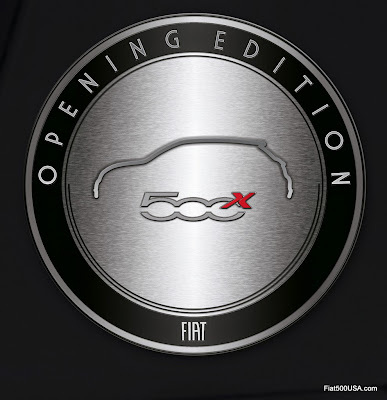 Fiat500USA.com will be covering the unveiling of the Fiat 500X next week, so keep checking back. After making its debut at the Paris Motor Show with an original reveal, today the 500X is presented to the international press, the new compact crossover from the 500 family which marks the evolution of the brand, a further expression of the technological maturity that runs in its blood. A beauty with character, the new car explores a brand-new dimension of being 500, where a mature, elegant, all-Italian style “clothes” – like haute couture – the substance of a car that is comfortable, high-performance and always in touch with the world: this is the X side of beauty, and this is the soul of the Fiat 500X. 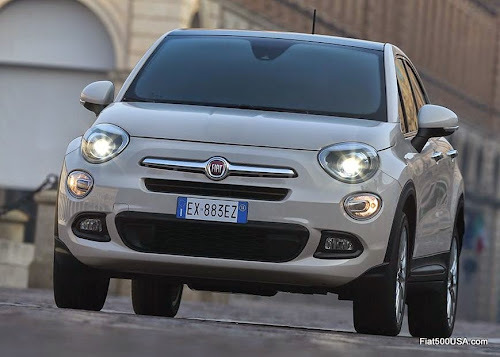 A descendant of the 1957 Fiat 500 – the stylistic reference of the rounded lights and the classic logo with the chrome-plated mustache on the front end is clear – the new Fiat crossover extends the 500 family, comprising the 500, 500C, 500L, 500L Trekking and 500L Living models: cars diverse in vocation and character, but which all share the same roots: the iconic Fiat 500. Built at the updated SATA plant in Melfi (Potenza) and sold in more than 100 countries worldwide, including the United States, the new Fiat 500X will be available in two different versions with two different souls – one more "metropolitan", the other ideal for leisure use -, equipped with efficient diesel and petrol engines, three types of transmission – manual, 9-speed automatic or twin-clutch 6-speed automatic – and with front-wheel drive, all-wheel drive or front-wheel drive with "Traction Plus" configurations. 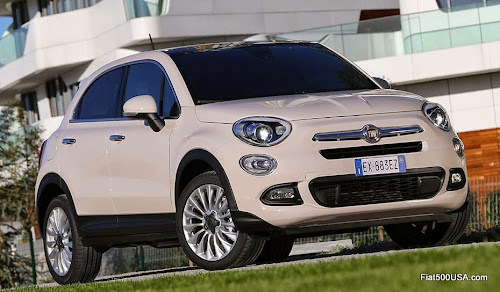 The Fiat 500X is a crossover not only in its very nature, but also because it appeals to a wide range of customers, male and female, of different ages, with different needs and tastes. In this sense, the "X" symbol represents a crossroads between several very different segments, each inhabited by the young and the mature, lovers of beauty and connoisseurs of character. These people are dynamic, with an active social life and they cultivate different passions and interests. What they have in common, however, is the desire to enjoy a satisfying driving experience and express their own personality through a distinctive style. For all of them today, there's one clear, comprehensive response: the Fiat 500X. The 500X comes in two versions: the first - available in Pop, Popstar and Lounge trim levels and featuring distinctive, elegant styling - is sure to win over young, dynamic, metropolitan customers. The second version - available in Cross and Cross Plus trim levels and boasting a more off-road look and technology - is the ideal solution for those who love leisure and the outdoors, but don’t want to compromise on the unique style of the Fiat 500. 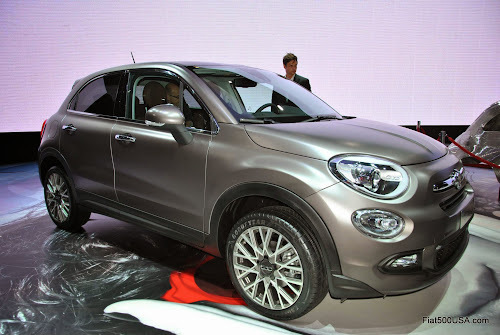 The new Fiat 500X crossover will be available from 2015. 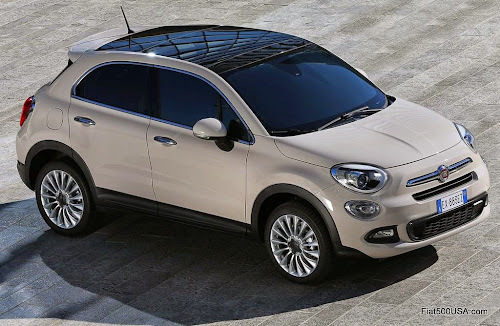 Designed by the Centro Stile Fiat, the new 500X represents a new dimension of the unmistakable 500 in which iconic style and the modern crossover concept collide, with the addition of the respectable off-road capability of a version that's perfect for outdoor pursuits. 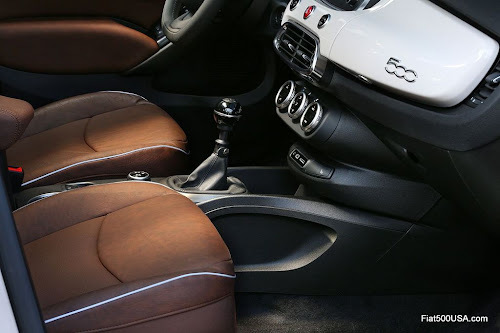 The unequivocal expression of "Made in Fiat" design, the 500X offers flexibility, rationality and quality, all firmly embedded in its compact dimensions, in its ample interior space and the choice of premium materials and fabrics, as well as the most sophisticated technology at the service of safety, comfort and on-board well being. The Fiat 500X is a casual, fun vehicle you can "wear" every day, an original piece of clothing featuring soft shapes for maximum freedom of movement, sure to reflect the personality of its driver thanks to the host of customization options available. The solid, robust appearance of the car finds its perfect stylistic counterpart in the harmonious lines, which emerge in dimensions ideal for customers looking for the comfort, space and equipment typical of a compact saloon. At the same time, the new 500X also gives a nod to those who need to tackle urban traffic every day, thanks to its modest dimensions: it’s 4.25 metres (167.32 inches) long (2 cm more for the leisure version), 1.8 meters (70.87 inches) wide and 1.60 meters (63 inches) in height (or 1.61 (63.39 inches) and 1.62 meters (63.78 inches) respectively with roof bars or four-wheel drive). Compact outside, welcoming inside: a spacious, protective environment with extensive use of high quality materials and finishes, and a host of practical storage compartments. A comfortable passenger compartment which is unmistakably Made in Italy, and available in no fewer than seven interior configurations, comprising a selection of different fabrics, leather, finishes and colours. Optimum functionality is ensured by the seat adjustment options and the spacious luggage compartment (12.36 cu ft or 350 litres). Finally, the customer can chose from 12 different liveries to emphasise the Fiat 500X's sensual form, further enhanced by a choice of eight different designs for the 16-, 17- and 18-inch alloy wheels. Depending on the EMEA market, the 500X is available with various combinations of engine, gearbox and transmission to meet all usage requirements, every one offering both respect for the environment and maximum efficiency in terms of performance, consumption and emissions. Available at launch will be the 140 HP 1.4 Turbo MultiAir2 (front-wheel drive and 6-speed manual gearbox), the 110 HP 1.6 “E-torQ” (5-speed manual gearbox and front-wheel drive), the 120 HP 1.6 MultiJet II (front-wheel drive and 6-speed manual gearbox) and the 140 HP 2.0 MultiJet II (9-speed automatic transmission and four-wheel drive). The range will then be topped off with the 170 HP 1.4 Turbo MultiAir2 (9-speed automatic gearbox and four-wheel drive), and the powerful 187 HP 2.4 litre Tigershark MultiAir2 (9-speed automatic transmission and four-wheel drive) petrol engines. The 140 HP 1.4 Turbo MultiAir II engine will also be available with front-wheel drive and 6-speed dual clutch automatic transmission. In particular, the innovative automatic and sequential dual clutch transmission ensures greater driving comfort and a sportier feeling, in terms of gear shift speed, offering increased efficiency and optimised consumption. Conceptually, it consists of two transmissions in parallel that permit extraordinarily rapid gear changes, releasing one clutch and engaging the other simultaneously. The following turbodiesel power units will also be available: the 95 HP 1.3 MultiJet II (5-speed manual gearbox and front-wheel drive), and the 140 HP 2.0 MultiJet II (6-speed manual gearbox and four-wheel drive). 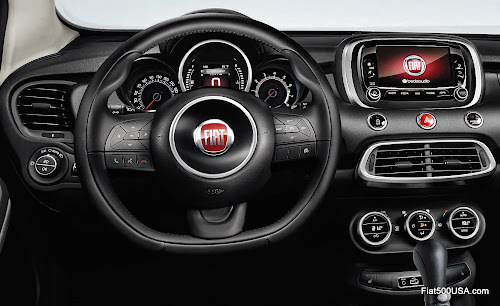 The 500X crossover is the first Fiat car to offer nine-speed automatic transmission. This transmission, available with the 170 HP 1.4 Turbo MultiAir II petrol engine and the 140 HP 2.0 MultiJet II turbodiesel, offers many advantages, including great pick-up capacity and smooth delivery of power. Electronically controlled, the new nine-speed automatic transmission features specific mapping, with the option to switch to manual-sequential mode. 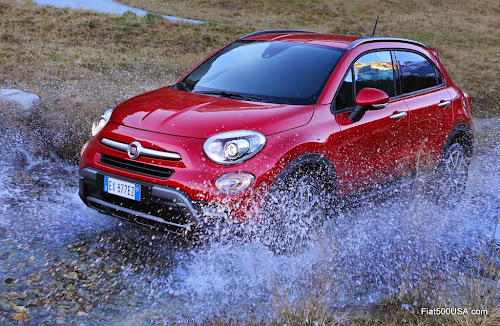 The new Fiat 500X is available in both two-wheel and four-wheel drive configurations. 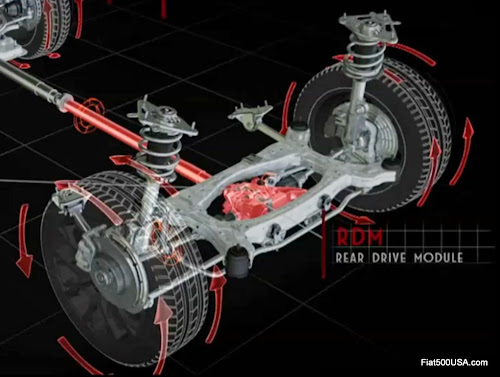 A particular feature of the new Fiat crossover’s four-wheel drive is the adoption of a rear axle disconnection system that reduces energy wasted through drag when four-wheel drive operation is not required, thus ensuring more efficient fuel consumption. The only vehicle in its segment to offer this feature, with the exception of the Jeep Renegade, the 500X's rear-axle disconnect seamlessly switches between two- and four-wheel drive for accurate torque management with no need for input from the driver. The new 500X features the "Mood Selector" drive selection system, which acts on the engine, brakes, steering and gearbox (in the case of automatic transmission), permitting three different vehicle behaviors based on the driving style most appropriate to the situation or road surface conditions: Auto (for the best in terms of comfort, consumption and CO2 emissions), Sport (for a drive that favors performance) and All Weather (for maximum safety even in poor grip conditions). On leisure trim levels, All Weather mode is replaced by the “Traction” function, which, on the four-wheel drive version, speeds up the transmission of torque to the rear axle. On front-wheel drive versions, the function activates the “Traction Plus” control system, which improves grip on tough, slippery terrain, for more economical, eco-friendly operation compared to conventional four-wheel drive, increasing efficiency during moderate, everyday off-road use. Equipped with MacPherson suspension at the rear on all versions, the Fiat 500X ensures the perfect balance of handling and comfort. What’s more, for guaranteed occupant protection, the new Fiat crossover combines a body designed according to the most modern criteria with active and passive safety content to ensure excellent performance. A host of content is available as standard throughout the range, such as six airbags (front, window bags and side bags), front headlights with the Daytime Running Lights function and cornering fog lights, as well as the ESC system (Electronic Stability Control). In addition, depending on the version and the market, the advanced Lane Assist lane departure warning system and Blind Spot Assist, a lane change assistance system to get around blind spots, are available as standard or upon request. What’s more, on request, your 500X can be fitted with the new ParkView rear reversing camera and the "Brake Control" assisted braking system. 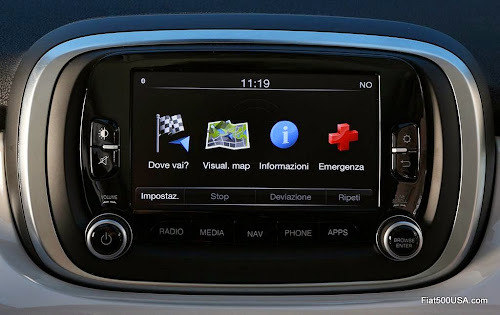 In terms of comfort and convenience, the Fiat 500X offers category-topping content, thanks to the sophisticated Uconnect™ systems with 5 or 6.5 inch touchscreens which provide access to radio, media, telephone and Uconnect™ LIVE services. Both versions come complete with Bluetooth interface, Aux-in connector, USB port and voice commands. Additionally, the Uconnect Radio Nav 5’’ device offers TomTom 2.5D navigation, while the 6.5" Uconnect Radio Nav features satellite navigation with 3D maps, progressive route guidance and ‘One Shot Voice Destination Entry’ to enter addresses using voice commands. Using the colour touchscreen, the system lets you access all the main functions: from the analogue and digital radio (DAB) through to all the main multimedia sources (media player, iPod, iPhone, smartphone) which can be connected via USB port or Aux-in socket, or using Bluetooth audio streaming. All of this can be managed directly using the steering wheel controls, so there's no need to take your eyes off the road or your hands off the wheel. The new Uconnect Live system also allows customers – through integration with their smartphones – to use many apps via the on-board system They can keep in touch with their friends on Facebook and Twitter, listen to millions of music tracks on Deezer and over 100,000 internet radio stations with TuneIn, get real-time news updates from Reuters and receive information on traffic, speed cameras and the weather forecast thanks to TomTom Live services. Finally, the Fiat 500X offers eco:Drive™, which permits a saving of up to 16% on fuel costs and reduces CO2 emissions, as well as the my:Car™ service, which features an interactive user manual to help with maintenance and deal with emergencies. For audio, the exclusive Hi-Fi Beats Audio system is available on request - developed in collaboration with Beats by Dr. Dre and launched for the first time on the 500L model - for a revolutionary music experience on-board the new Fiat 500X. 2 versions are available at launch (one more “urban” and the other ideal for leisure use), 5 trim levels (Pop, Popstar, Lounge, Cross and Cross Plus), 4 engine options (140 HP 1.4 Turbo MultiAir II, 110 HP 1.6 “E-torQ”, 120 HP 1.6 MultiJet II and 140 HP 2.0 MultiJet II), 3 drive systems (front, front with “Traction Plus” system and four-wheel drive), 3 gearboxes (five-speed manual, six-speed manual and nine-speed automatic), 12 body colours, 8 different alloy wheel designs (16”, 17 “ and 18”) and 7 different interior configurations. 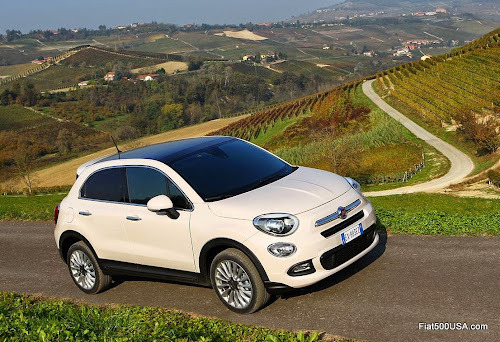 Depending on the market in question, the Fiat 500X range features some differences in content (standard or optional) in order to best meet the needs of the individual countries. To see the specific range for each country, visit your local Fiat Press website. A beauty with character, the new 500X explores a brand-new dimension of being 500, where a mature, elegant, all-Italian style “clothes” – like haute couture – the substance of a car that is comfortable, high-performance and always in touch with the world: this is the X side of beauty, and this is the soul of the Fiat 500X. Designed by the Centro Stile Fiat, the new crossover extends the 500 family, comprising the 500, 500C, 500L, 500L Trekking and 500L Living models - cars diverse in vocation and character, but which all share the same roots: the iconic Fiat 500 of 1957. The 500X represents a new dimension of the unmistakable 500 in which iconic style and the modern crossover concept collide, with the addition of the respectable off-road capability of a version that's perfect for outdoor pursuits. The unequivocal expression of "Made in Fiat" design, the 500X offers flexibility, rationality and quality, all firmly embedded in its compact dimensions, in its ample interior space and the choice of innovative materials and fabrics, as well as the most sophisticated technology at the service of safety, comfort and on-board wellbeing. In short, the 500X is a casual, fun vehicle you can "wear" every day, an original outfit with soft shapes for maximum freedom of movement and, thanks to the host of customization options, it reflects the personality of its driver. From the very first glance it's clear that in this car, the stylistic roots of the 500 find a brand new interpretation, more "masculine" without ever flaunting excessive muscularity of form. In fact, despite the increased dimensions and generous wheelbase, the Fiat 500X offers fluid lines which give it grace and dynamism. 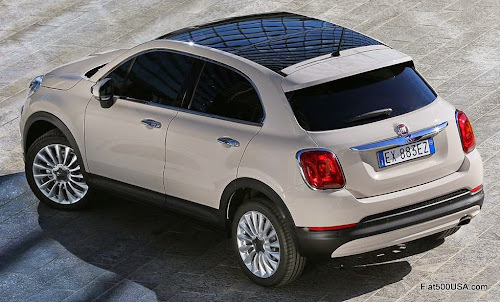 In particular, the exterior style of the new Fiat crossover expresses all the distinctive elements of both the current 500 family and the iconic 500 of the Fifties. 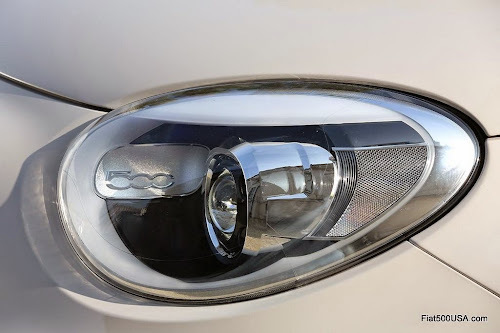 The most evident reference to the model's precursor comes in the combination of the upper headlights, which although circular, have a more dynamic cut for a more "frowning" look, with the lower "main beam" lights and the “moustache and logo” design. The wraparound bonnet with side folds too is a 500 style feature, just like the front end, with its extreme stylistic harmony, the classic trapezoid muzzle and, at the centre, the elegant chrome moustache. Just underneath you'll find the black lower grille - a stylistic feature introduced on to the 500 in 2007 – which gives the vehicle its “friendly” look and, at the same time, brings robustness and strong personality. The vehicle's solid, robust appearance finds its perfect stylistic balance in the harmonious lines contained in its modest dimensions: the car is 4.25 metres long (2 cm more for the leisure version), 1.8 metres wide and 1.60 metres in height (or 1.61 and 1.62 metres respectively with roof bars or four-wheel drive). From the side the vehicle offers a waistline slightly slanted to the front which enhances its robustness and underlines the "dynamicity" of the design. In detail, the side section offers an up-to-date version of the historic 500 look, but with cleaner, more modern surfaces, interrupted by the generous wheel arches and the robust door sections. All enhanced even further by the ground clearance - 162 mm for the FWD versions and 179 mm for the AWD configurations (values measured in standard A) - and by the oversized wheels. What's more, thanks to the adoption of outstanding off-road features such as specific bumpers and protective skid plates, the Cross and Cross Plus versions of the 500X ensure excellent typical off-road angles: the approach angle is 21.3°, the exit angle 30.1° and the ramp angle is 22.3° (values measured in standard A). The 500X's rear end features a characteristically shaped chrome-plated handle that is reminiscent of the "bicycle-saddle" number plate light of its predecessor. The light clusters are housed between the tailgate cuts, and the way they light up makes them unmistakable at night, thanks to the flowing shape of the brake lights and side lights. The rear window "cuts" the tailgate at the sides, creating a simplified, modern glass graphic, while the spoiler at the top of the tailgate brings a contemporary twist, and plays its part in the excellent overall aerodynamic value (0.34 CX). The stylish Italian design can also be seen in the detailing that makes the 500X truly unique, such as the elegant chrome trim - from the front door handles with their 'mustache' emblem, to the light cluster frames and the luggage compartment handle - or the “Sky Dome” glass sunroof which, adjoining the window, offers a linear, light-filled roof, highlighting the two arches of the pillars. Completing the new vehicle's exterior style, the wide range of mitalised and pastel colors, for a host of pop-inspired customization options, typical of the 500 DNA, featuring bright, vibrant tones and primary colors such as red, yellow and blue, alongside cooler, more sophisticated lounge options such as grey, and even, for the leisure version, outdoor tones such as Matt Bronze. Every color option comes with a selection of complementary interior fabrics or leather, and of course you can count on a dashboard which reflects the outside colour inside. A total of 12 different liveries emphasize the sensual form of the Fiat 500X, further enhanced by the eight different designs for the 16-, 17- and 18-inch alloy wheels. Compact outside, welcoming inside: a spacious, protective environment with extensive use of high quality materials and finishes, and a host of practical storage compartments. 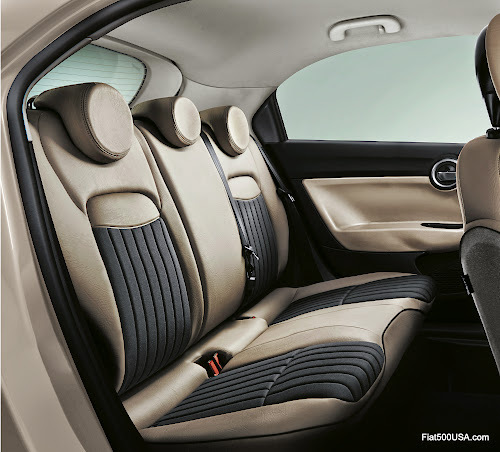 Specifically, the passenger compartment of the Fiat 500X features a complete, modern and ergonomic set-up, in a design inspired by the historic 500 look. 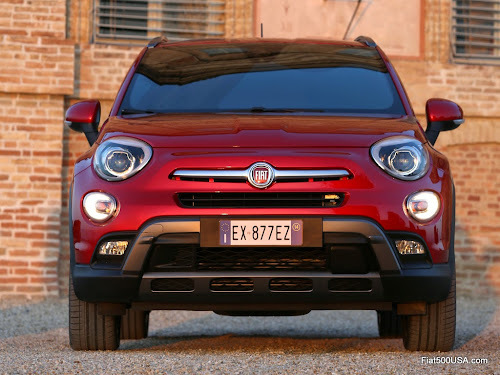 A car with character like the Fiat 500X boasts one of its strengths in its driving seat. Once you sit behind the wheel, you immediately notice the excellent instrument layout, the usability and comfort of the controls, all directed towards the driver and grouped by function. The driving experience is even more enveloping thanks to the vertical tilt of the steering wheel, to the H point just 669 mm from the ground (697 mm for four-wheel drive versions), the wraparound seats and the generous leg space. Based on a cockpit structure, the driver's side features an instrument panel divided into three circular sections, of which the centre section is larger with a metallic trim - clearly reminiscent of the historic Fiat 500 - the ideal combination of retro aesthetic and modern technology. To the sides, two matching quadrants contain the speedometer and rev counter, and at the center the 3.5” re-configurable TCT display communicates information to the driver simply and instantly, as well as offering numerous customization options. The steering column boasts a new sports shaped steering wheel, which offers improved hand positioning and perfect grip, enhanced with stylish chrome inserts and housing the radio controls to ensure accurate, relaxed driving in any situation. All topped off by the optimum gear lever position on the central tunnel and the comfortable front armrest. The central section of the dashboard also features three of the most frequently used buttons which resemble the little levers on the old 500, while immediately above you'll find the 5" display of the Uconnect system (also available in a 6.5" version with integrated navigation system). To the bottom you'll find the air vents and the climate controls. Another 500 style feature comes in the new crossover's dashboard which, on the more "urban" version, reflects the outside color inside. Depending on the trim level, two stylish finishes are available for the central tunnel and the door panels: a geometric pattern born from the revisited Carbon Look or a continuous brushed steel. The same exclusivity characterizes handles with their classic "hook" shape, reminiscent of the most memorable door feature of the historic 500. 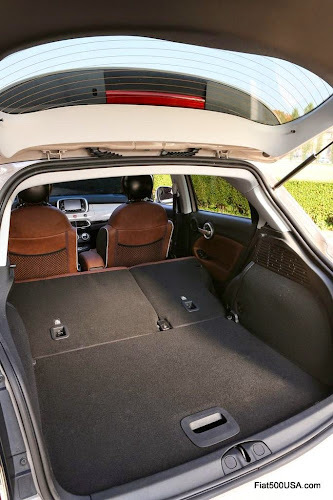 A superlative expression of Italian manufacturing, the new Fiat 500X offers maximum functionality, as demonstrated by the numerous compartments of various sizes spread throughout the passenger compartment. In fact, although the top of the dashboard is tasked with bringing stylish elegance, with its soft, upholstered surfaces, the lower section houses a selection of spacious open storage compartments, as well as medium and small storage boxes to keep your most treasured belongings out of sight. The 500's extensive storage space includes four spacious door compartments, a large closable box at the bottom of the dashboard and a second box, also lidded, located in the colored band in front of the passenger seat, embellished with the model's chrome badge, as well as two cup holders on the central tunnel which provide a safe spot to store drinks containers of various sizes. Depending on the trim level, the front centre armrest can also be equipped with a handy storage compartment, as well as being longitudinally adjustable for increased comfort. 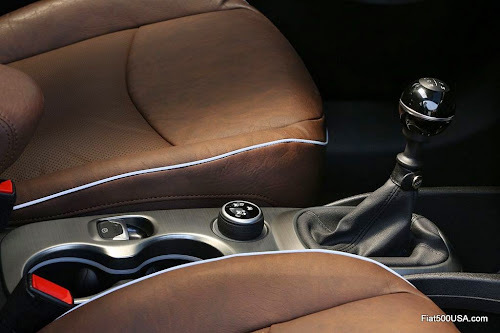 There is useful space in front of the gear lever too, where you'll find a special console for storing small objects, that also provides a docking station for your devices (smartphones, MP3 players and more) which, thanks to the USB and Aux-In ports, can be charged or hooked up to the Uconnect system. The front seats also include a handy net pocket to the rear, and the passenger seat boasts a folding backrest: lowering the rear seats using the Fold&Tumble function creates a flat loading surface for the entire length of the passenger compartment, for optimum use of the interior space. The same versatility is offered by the rear seat with its 60/40 split folding backrest and the spacious luggage compartment (the 350 litre capacity becomes 1000 litres with the rear seats completely folded down). What’s more, on request, your 500X can be fitted with a removable load platform which is reversible and height adjustable. The passenger compartment is a pleasant place to be, offered in no fewer than seven interior configurations, created by combining different types of fabric, leather, finishes and colours, where the surprise lies in the detailing. 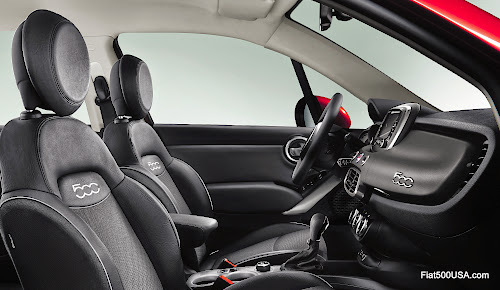 The interior of the Fiat 500X Pop is black, with panels in grey Scuba, a new material with a sporty, technical touch, similar to neoprene, and the dashboard is available in five body colours. The door panel mouldings and the top section of the tunnel are carbon look. The second trim level (Popstar) is available in two variations: black with grey Scuba detailing, or black with red Scuba detailing, both with carbon look tunnel and body coloured dashboards. Fiat 500X Lounge customers can choose between Moka and Light Dove interiors, enhanced with stylish piping, plus a brushed steel effect on the top of the tunnel (with dashboards available in all outer body colours). The Fiat 500X Cross features a hi-tech interior with a more textured dashboard insert, reminiscent of a fusion of cast iron, for a matt, three dimensional effect, as well as a brushed steel effect on the upper deck of the tunnel and the panel mouldings. The same features are also included on the 500X Cross Plus. Completing the range are two versions available, upon request, with the high class leather upholsteries: both feature a brushed steel effect on the tunnel deck and panel mouldings, and one offers an black ambiance with subtle side inserts in red to highlight the vehicle's dynamic nature, while the other features tobacco detailing for a more heritage, traditional look. A passenger compartment that's undeniably Italian, offering all the on-board wellbeing typical of vehicles in higher segments. The interior benefits from the extensive use of sound-absorbent materials - with the dashboard upholstered in soft-touch fabrics on all versions - as well as a host of technical features such as, for example, the PVB layer inside the windscreen which improves the articulation index, and the acoustic deflectors on the pillars - brand new in the vehicle's segment - created entirely from absorbent foams. Also contributing the outstanding comfort are the ergonomic seats made mostly from variable density foam for the sides, seat and backrest. As standard, the driver's seat features longitudinal and height adjustment and a reclining backrest. Lumbar adjustment and heated seat function are also available on request. The rear bench - split 60/40 - offers excellent comfort for three passengers and reflects, on all versions, the extreme attention to detail of the front seats. Depending on the trim level, a choice of upholstery fabrics and colours are available, all with the classic chromatic "breakdown" of the 500 family - single colour fabric to the bottom, and the top section and headrests to match the colour on the door panels and dashboard. 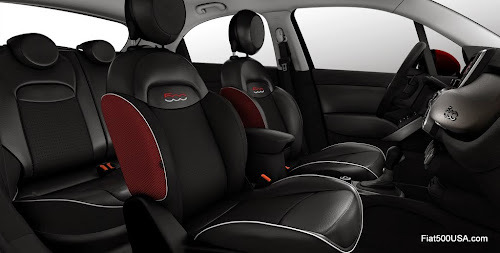 In particular, the Pop versions offer high quality fabrics in black with black inserts, with the headrests and the upper section of the seats in grey Scuba with 500 logo. And 500X Popstar customers can choose from two options: black fabric and inserts with grey Scuba upper section and headrests or black fabric seats with grey inserts, and red top section and headrests. Finally, the Lounge version features two solutions: dark brown with electrowelded fabric inserts and silver 500 logo, or beige upholstery with electrowelded fabric sections and anthracite 500 logo. Completing the range are the Cross and Cross Plus trim levels, both featuring black fabric upholstery with grey inserts and silver 500 logo. Finally, on request, your 500X can be fitted with high quality leather upholstery in black/red or tobacco, both with silver 500 logo. To demonstrate the designers' outstanding attention to detail, even the mats in the 500X are unique and exclusive: they feature a print of a map of the Melfi factory, an original way of expressing the pride taken by the Italian manufacturers in creating a high quality product with enormous charm. Depending on the EMEA market, the new Fiat 500X offers various combinations of engine, gearbox and transmission to meet all usage requirements, every one offering both respect for the environment and maximum efficiency in terms of performance, consumption and emissions. Available at launch are the 140 HP 1.4 Turbo MultiAir2 (front-wheel drive and 6-speed manual gearbox), the 110 HP 1.6 “E-torQ” (5-speed manual gearbox and front-wheel drive), the 120 HP 1.6 MultiJet II (front-wheel drive and 6-speed manual gearbox) and the 140 HP 2.0 MultiJet II (9-speed automatic transmission and four-wheel drive). The 1.4 Turbo MultiAir2 engine is a cutting edge petrol power unit. Available on front-wheel drive versions and teamed with a six-speed manual gearbox, the MultiAir2 generates maximum power of 140 HP at 5000 rpm and maximum torque of 230 Nm at 1750 rpm. Values which imply elasticity and sparkling performance, as demonstrated by the top speed of 190 km/h and acceleration from 0 to 100 in 9.8 seconds. Outstanding performance combined with low consumption and emissions: suffice to say that, in the combined cycle, the recorded figures are 6 l/100 km and 139 g/km CO2 respectively. The source of this stunning performance lies in the MultiAir technology, which marks a departure from the standard petrol engine set-up, a genuine generational leap that is comparable to the introduction of MultiJet technology for diesel engines. Simply consider the fact that, compared to a conventional petrol engine of equivalent size, a MultiAir engine develops more power (up to 10%) and torque (up to 15%), while consuming significantly less fuel (up to 10%) and emitting less CO2 and particulates (up to 10%) and less NOx (up to 30%). At the heart of MultiAir is its electro-hydraulic valve management system that reduces fuel consumption by controlling air directly via the inlet valves (without using the throttle) and reduces polluting emissions too (via combustion control). As befits a flag-bearer for the "downsizing" concept, MultiAir is a versatile technology that is easily applied to all petrol engines. Euro6 type approved and fitted with the Start&Stop system as standard to reduce fuel consumption and CO2 emissions, the 140 HP 1.4 Turbo MultiAir2 features a series of components designed specifically to reduce friction and improve performance and fuel consumption efficiency. The engine is fitted as standard with a smart alternator for maximum efficiency. 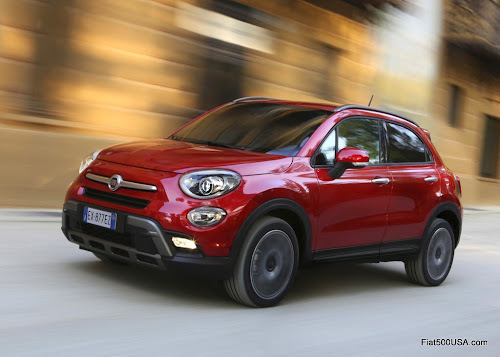 The new Fiat 500X offers two turbodiesel engine options - 1.6 or 2.0 litres – fitted with second generation MultiJet technology to guarantee an enjoyable drive, great autonomy and low running costs. Teamed with a six-speed manual gearbox, the 1.6 Multijet II generates 120 HP at 3750 rpm, allowing the new Fiat crossover to reach a top speed of 186 km/h and accelerate from 0 to 100 km/h in 10.5 seconds. Using a variable geometry turbocharger means delivering high torque at low rpm (320 Nm at 1750 rpm) for maximum running flexibility. All with optimum respect for the environment - the power unit is Euro6 type approved – and with maximum attention to fuel consumption and emissions efficiency: on a combined type approval cycle, the 120 HP 500X 1.6 MultiJet II registers 4.1 litres/100 km of fuel and 109 g/km CO2 emissions. Increased power and better performance are ensured by the 2.0 Multijet II which, fitted with an electronically controlled variable geometry turbocharger, develops maximum power of 140 HP at 4000 rpm and maximum torque of 350 Nm at 1750 rpm. Paired with the innovative nine-speed automatic gearbox, the power unit assembly allows the 500X to reach a top speed of 190 km/h and to accelerate from 0 to 100 km/h in just 9.8 seconds, as well as respecting the Euro6 emissions limits. 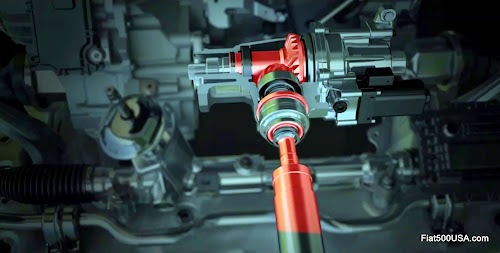 Shared by both of the Fiat 500X's turbodiesel engines, the third-generation Common Rail injection system represents the most technologically advanced solution for controlling high injection pressures (1600 bar) independently of the engine rotation speed and quantity of fuel injected. In fact, the engine management is capable of introducing small quantities of fuel (pre-injections) to optimise noise and emissions and to manage with the main injection the amount of fuel injected to provide the performance requested by the driver, ensuring particularly "smooth" engine operation in all situations. In detail, the innovative injectors allow the management of up to eight injections per cycle and actuate increasingly advanced strategies focused on optimising combustion, such as the Injection Rate Shaping (IRS) system which involves two consecutive injections so close together in time as to generate a continuous and modulated fuel supply into the cylinders. With this method, the combustion process is improved, all to the benefit of quieter operation and lower particulate and nitrogen oxide (NOx) emissions. Furthermore, the new injection system is even simpler and more reliable because the injectors have a simpler structure. The 120 HP 1.6 MultiJet II and 140 HP 2.0 MultiJet II engines have also been fitted with a number of features to reduce fuel consumption and emissions. 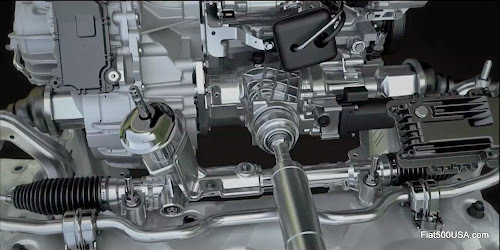 These include a smart alternator that modulates the dispensing of energy depending on the vehicle's actual needs and the battery charge level, engine cooling circuit optimisation that reduces warm-up time and a variable displacement oil pump that adjusts the oil pressure appropriately, reducing the power consumed by the pump. Naturally, the Start&Stop system is included, while the engine and transmission use low viscosity lubricant oil to minimise friction. And the exhaust gas treatment system implements close-coupled DPF technology, which efficiently integrates the oxidising catalytic converter and the particulate filter (CCDPF). The component is compact to reduce exhaust counter-pressure with beneficial effects in terms of reduced fuel consumption and CO2 emissions. The particulate trap is arranged close to the turbocharger outlet to provide hotter gas temperatures on average near the particulate filter. This reduces the amount of diesel fuel needed for regeneration with a subsequent further reduction in consumption. The oxidising catalytic converter has also been integrated into new NSC (NOx Storage Catalyst) technology which, thanks to a specific chemical formulation combined with sophisticated injection management software strategies, is capable of reducing NOx emissions by 60%, playing an important role in keeping vehicle emissions within the Euro6 limits. The integration of the two components reduces the weight of the exhaust system and improves global efficiency. The CCDPF is combined with an advanced dual-circuit exhaust gas recirculation (EGR) system in which - in addition to the very small sized EGR element already present on previous versions - a second circuit has been added that collects the exhaust gases downstream of the DPF and cools them using a dedicated cooler, allowing precise control of the combustion process, reducing both NOx emissions and fuel consumption. 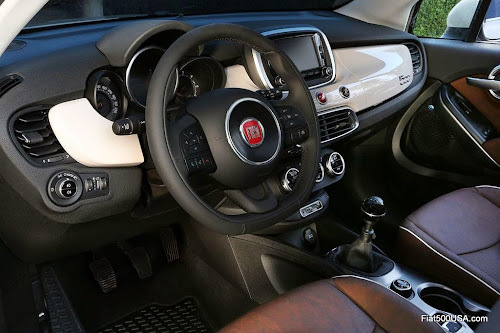 The 500X crossover is the first Fiat car - and the only vehicle in its segment with the exception of the Jeep Renegade - to offer the brand new nine-speed automatic gearbox. Available at launch exclusively with the 140 HP turbodiesel 2.0 MultiJet II, the innovative transmission allows the vehicle to optimise the power developed by the engine, at the same time enabling aggressive pick-up and smooth, efficient power delivery. Electronically controlled, the nine-speed automatic transmission features specific mapping, with the option to switch to manual-sequential mode. The innovative transmission also ensures increased reactivity, with faster acceleration and more fluid gear shifting. The gearbox's wide opening, in terms of ratios, ensures that the engine is always working within the optimum speed range, maximising comfort, driving pleasure and efficiency. In detail, the advanced gear shift management software involves dozens of inputs - from various on-board sensors - in order to adopt the ideal behaviour in all driving and environmental conditions. For example, there are systems to monitor engine torque, longitudinal and lateral acceleration, ESP actions, road gradient and temperature. The result? Optimum driving comfort and maximum efficiency. 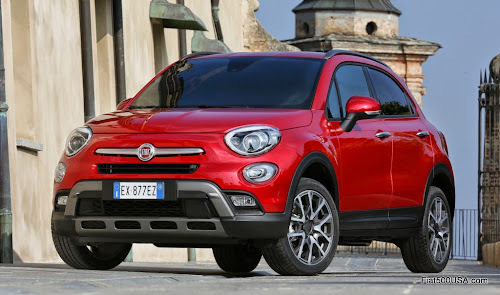 The versions of the Fiat 500X equipped with the 140 HP 1.4 Turbo MultiAir2 and 120 HP 1.6 MultiJet II engines feature six-speed manual gearboxes and front-wheel drive. 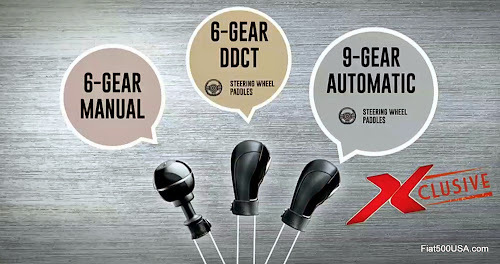 Part of a new family of transverse, three-axle transmissions, the 500X's manual six-speed gearbox is synchronised in all ratios for smooth gear shifting. The gearshift bowdens are fitted with a self-regulation mechanism for improved gear shift quality and Start&Stop system management. Finally, the clutch is fitted with a dual mass flywheel which reduces noise and vibrations at low speeds. The clutch is hydraulic to reduce operating effort and pedal vibrations. 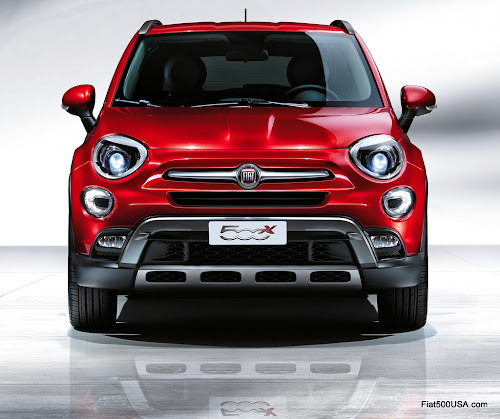 The new Fiat 500X is available in both two-wheel and four-wheel drive configurations. 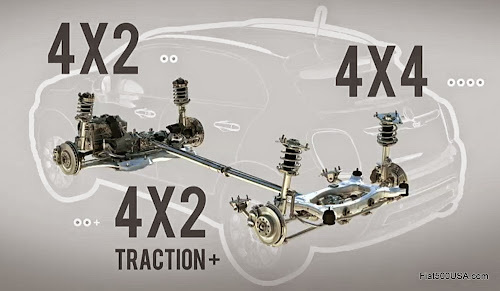 One special feature of the new Fiat crossover's four-wheel drive system is the use of a rear axle disconnection system - in fact, with the exception of the Jeep Renegade, the 500X is the only vehicle in its segment to offer this. The new Fiat crossover also offers the " Mood Selector" drive selection system with three modes – “Auto”, “Sport” and “All Weather” – which, on the leisure versions, replaces the third option with “Traction” mode. 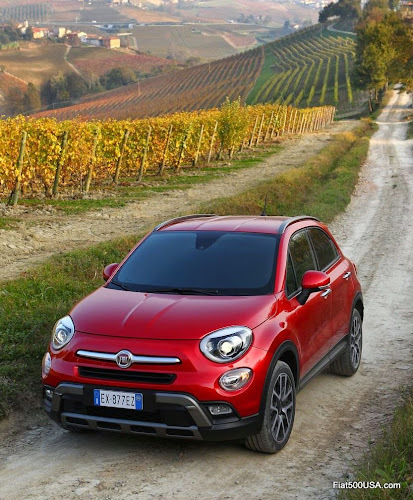 The new Fiat 500X is available in both two-wheel and four-wheel drive configurations. The first is the solution most commonly used on Fiat models, while the second is new for the brand and for the segment: in fact, a particular feature of the 500X’s four-wheel drive is the adoption of a rear axle disconnection system that permits a reduction in energy wasted through drag when four-wheel drive operation is not required, thus ensuring greater efficiency in terms of consumption. The only vehicle in the segment to offer this, with the exception of the Jeep Renegade, the rear-axle disconnect switches between two- and four-wheel drive - seamlessly and at any speed -, ensuring engine torque transfer without no need for driver input. What's more, by interacting with the electronic stability control (ESC), the system takes the necessary corrective actions to ensure vehicle stability, improving response in the case of over or understeer. The 500X's four-wheel drive can transfer up to 200 Nm (147 lbs/ft) of engine torque to the rear wheels, ensuring optimum road holding even in poor grip conditions. Finally, an oil bath clutch - housed in the rear differential - uses specific patented algorithms to provide the appropriate level of torque in every driving situation, even on poor grip surfaces and during aggressive starts and sports driving. 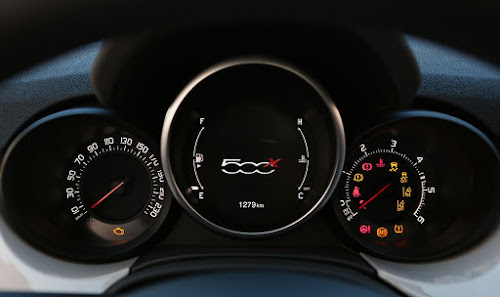 The new 500X offers the "Mood Selector" drive selection system, which acts on the engine, brakes, steering, automatic transmission and four-wheel drive, allowing for three different vehicle behaviour modes based on the driving style best suited to the situation or the road surface conditions. Activated using the three-position control on the central tunnel, the system is available on all versions of the new Fiat crossover, with the exception of the 500X Pop, and offers specific functions depending on the vehicle traction type. “Auto” mode is calibrated for everyday driving and ensures maximum comfort and minimum fuel consumption and CO2 emissions. This is achieved through more regular engine calibration and increased power steering, as well as an optimised gear shift point to reduce CO2 emissions (the latter applies to automatic transmission only). "Sport" mode is perfect for driving when performance matters. The system switches to a specific calibration of the engine, the ESC system and the steering, to ensure a more direct, sportier driving response. In four-wheel drive vehicles, the system switches to specific set-ups to enhance the vehicle dynamic. For maximum safety, even in difficult grip conditions, the driver can select "All Weather" mode - only available on the more “urban” versions - which uses a specific engine calibration and specific ESC controls to maximise performance on slippery or uneven surfaces. 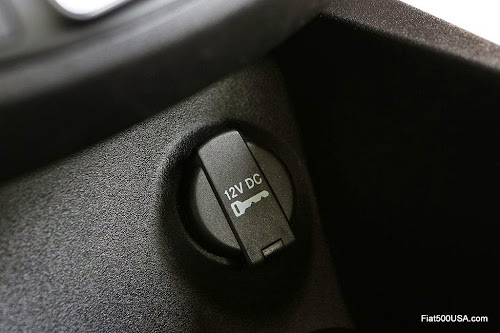 On leisure versions, "All Weather" mode is replaced by the “Traction” function which, on the four-wheel drive version, speeds up the transmission of torque to the rear axle. On front-wheel drive versions, the function activates the “Traction Plus” control system, which improves grip on tough, slippery terrain, for more economical, eco-friendly operation compared to conventional four-wheel drive, increasing efficiency during moderate, everyday off-road use. The “Traction Plus” system deploys ESC hardware, using designated algorithms to control and manage the braking system, electronically simulating the behaviour of a self-locking differential. Optimized software and the fact that force is applied through the normal braking circuit allow for more progressive action than that of conventional systems. Though performance is easily comparable, the system offers the added advantage of being much lighter. In conditions with poor or no grip on a drive wheel, the control unit detects drive wheel slippage and instructs the hydraulic circuit to apply braking force to the wheel with lower grip, thus transferring power to the wheel on the surface providing the better grip. This improves handling, maintains directional stability and control, and ensures the best possible traction even over very rough or poor grip terrain. 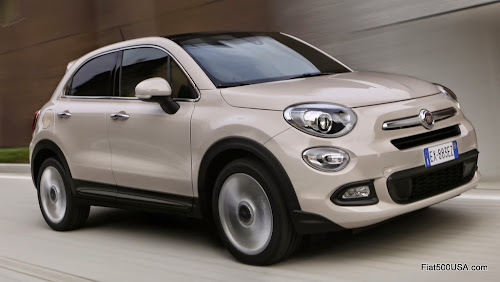 Designed and manufactured to offer optimum safety, comfort and dynamic driving, the Fiat 500X uses innovative "Small Wide" modular architecture to ensure greater quality and reliability, as well as faster development and assembly. 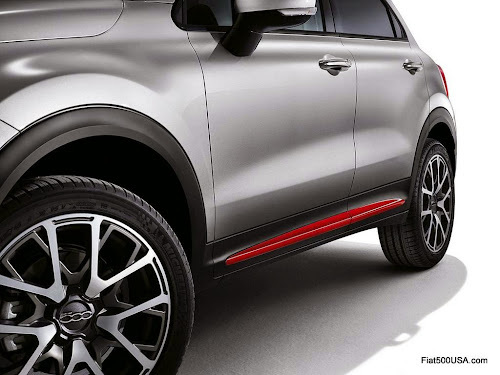 The architecture of the Fiat 500X ensures exceptional torsion resistance, for optimum control of the body geometry. What's more, thanks to the MacPherson independent wheel suspension, the 500X sets out new standards in its segment for safe, dynamic driving. The Fiat 500X also offers increased precision and driving pleasure thanks to the electric power steering and the DST (Dynamic Steering Torque) system which improve handling. The new Fiat 500X boasts segment-topping performance in terms of comfort and NHV (noise, vibration and harshness), thanks to the high natural frequency of the body and the extensive use of soundproof materials. The structural rigidity of the Fiat 500X is achieved thanks to the extensive use of high-strength steel (around 70% of the total) and structural adhesives which serve to reduce the overall vehicle weight, to improve longevity and to maximise resistance in the case of collision. With the same objectives in mind, the 500X is fitted with a front crossmember and hybrid rear crash-box (plastic/steel). The body's interfaces with the mechanics and power units are designed to ensure increased rigidity in order to reduce noise inside the passenger compartment. The new 500X is a car for experiencing relaxing moments and comfortable travel, thanks in part to the layout of its MacPherson independent wheel suspension - both to the front and to the rear. On the front axle, the Fiat 500X features a special dual-function crossmember: it offers the high rigidity required to achieve greater acoustic comfort and also to integrate a third load line to improve energy absorption capacity in the case of collision. The new vehicle also features a "split" type of shock absorber mounting that transmits vibrations from the road to the body structure through two different pathways, improving acoustics and shock absorption efficiency. 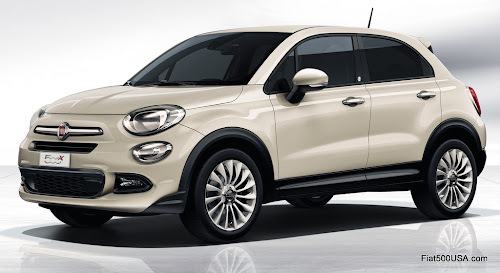 The Fiat 500X offers increased steering precision thanks to the electric power steering and the DST (Dynamic Steering Torque) system, which improve handling and dynamicity, as well as reducing fuel consumption by up to 3% compared to a conventional hydraulic system. The 500X's DST system improves both driving safety and handling performance by actively correcting over and understeer. The DST system is completely integrated into the vehicle's electronic stability control (ESC) system and intervenes to correct potentially dangerous situations such as in the case of excessive deflection angles or instability caused, for example, by poor wheel grip. To ensure the protection of its occupants, the new Fiat 500X offers the finest in currently available active and passive safety systems. The entire range features as standard 6 airbags (front, window-bag and side), ESC (Electronic Stability Control) and fog lights with “cornering” function. 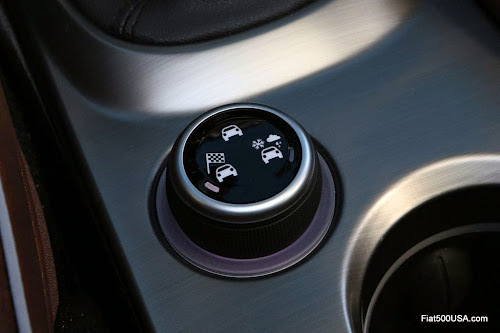 In addition, depending on the trim level and market, the advanced Lane Assist lane departure warning system and Blind Spot Assist, a lane change assistance system to get around blind spots, are available as standard or on request. On request, your 500X can also be fitted with the new ParkView rear reversing camera and the "Brake Control" assisted braking system. 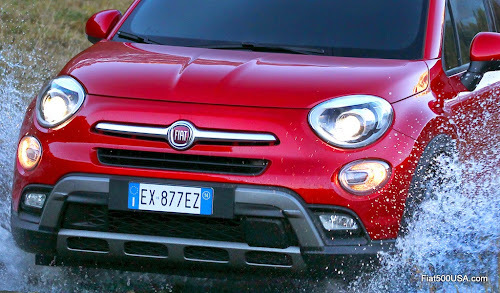 The Fiat 500X's hydraulic, power-assisted braking system comprises two independent, crossover circuits and has proven particularly effective in allowing prompt, progressive braking, as well as shorter stopping distances. 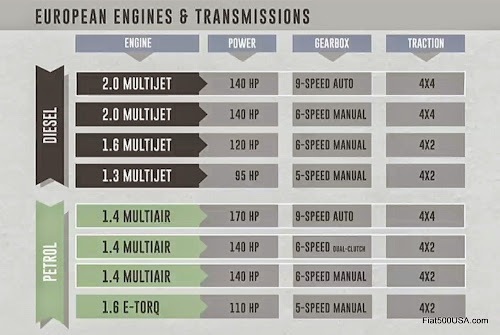 Of course, the system differs from one engine version to the next (in terms of weight and power): cars equipped with the 1.4 Turbo MultiAir and the 1.6 Multijet are fitted, on the front wheels, with 281 mm self-ventilating front brake discs, while the 500X with 2.0 Multijet features 305 mm self-ventilating discs. For all engine options, the rear discs measure 278 mm in diameter. As well as a high performing brake system, the Fiat 500X is fitted with the ABS anti-lock system complete with EBD (Electronic Brake force Distribution), which distributes the braking action over all four wheels, in order to stop the wheels locking and ensuring complete vehicle control in all conditions. The system adapts its operation according to the wheel grip conditions and to the brake pad efficiency, also reducing brake pad overheating. One of the most innovative features available on the new Fiat 500X is the "Brake Control" assisted braking system, which uses radar sensors and video to detect if the car is approaching another vehicle or obstacle too quickly and alerts or assists the driver in order to avoid impact or mitigate the consequences. Brake Control operates between 7 km/h and 200 km/h, generating acoustic and visual warnings, as well as a brief deceleration to alert the driver. If the driver does not react, the system brakes the vehicle to avoid or mitigate impact. Operating independently, the system is capable of avoiding collisions with stationary objects at speeds of up to 30 km/h and objects moving in the same direction if the relative speed is below 50 km/h. In other cases, the system mitigates the collision, but also alerts the driver, who then has the chance to react and avoid impact. The driver has the option to adjust the system sensitivity to one of three levels, or to disable the alerts he or she prefers. The system meets the safety requirements of both American body NHTSA and EuroNCAP. This system uses the camera's optical sensor to establish the road position of the 500X with respect to the horizontal markings present on the road surface. In the case of an unintentional lane change, which the system recognises if the vehicle changes trajectory without activating the direction indicators, a visual alert is issued along with a tactile signal sent by the electric power steering (EPS). If the driver does not react promptly, the system issues a second visual alert. 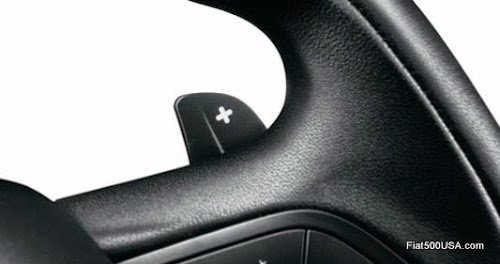 The system can apply torque to the steering wheel to counteract the unintentional lane change. Lane Assist operates at speeds of between 60 and 180 km/h and can be activated by the driver. Blind Spot Assist uses ultra broadband radar sensors that assist the driver during lane changes and when the car is overtaken or overtakes a vehicle concealed from view. The system notifies the driver of the presence of vehicles in blind spots using illuminated icons on the side mirrors and by activating an acoustic signal selected by the driver. When reversing out of a parking space, the system also informs the driver when it detects vehicles approaching from the side. Once activated, Adaptive Cruise Control reduces the vehicle's programmed cruising speed when it approaches another vehicle in the same lane or when another vehicle enters the same lane. The system returns to the programmed speed when the vehicle in front accelerates or moves to another lane. The system also maintains a certain distance from the vehicle in front, adjustable by the driver, which is particularly useful in adverse weather conditions or situations where visibility is reduced. Displayed on the screen of the Uconnect™ 5.0” or Uconnect™ 6.5” device, the camera offers a wide-angle view of the area immediately behind the vehicle, thus allowing the driver to reverse more safely and with greater peace of mind. A dynamic line grid to use as reference for parking manoeuvres in tight spots and narrow spaces is displayed on the screen. The system is also useful for aligning a trailer for hook-up. When you approach the car and pull the door handle, the "Keyless Entry & Keyless Go" system's electronic control unit checks whether the key is in the vicinity and, on recognising the secret codes transmitted via radio frequency, unlocks the door. And with the door unlocked, all you need to do is get behind the wheel and start the engine by pressing the button on the dashboard. Using ultrasound sensors, the system detects objects close to the vehicle during reverse parking at low speed. If a collision is established as imminent, the system alerts the driver on the instrument panel and with an acoustic signal. Hill Start Assist helps the driver during hill starts by maintaining the level of brake pressure applied by the driver for a short period after the brake pedal is released. If the driver does not accelerate during this short period, the system will release the braking pressure. An anti-slip system which optimises traction at any speed, with the help of the brakes and engine management, allowing the Fiat 500X to cope easily on poor grip road surfaces. When there is a brisk gear shift in poor grip conditions, the MSR function intervenes, restoring engine torque and preventing the wheels from locking, which could lead to a loss of vehicle control. This system improves both driving safety and handling performance. In fact, in any driving conditions, the "active electronic steering" carries out the required corrections automatically and also controls oversteer on poor grip surfaces. ERM intervenes when a wheel leaves the road surface: in fact, whenever an extreme dynamic movement is detected, the ERM helps to restabilise the vehicle and returns control of the car to the driver. 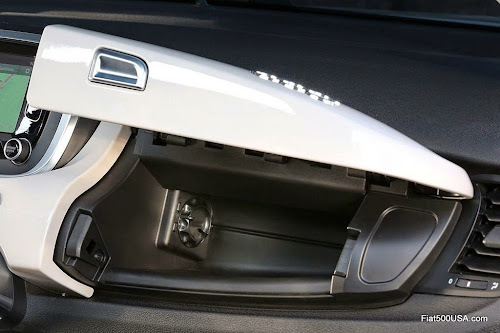 The system comprises of a parking brake switch in the centre console, a motor on the calliper of each rear wheel and an electronic control module. Four operating modes are available: static and release actioning, dynamic actioning in case of emergency, set-off release when starting and SafeHold. The TPMS informs the driver that the tyre pressure is too low. The system uses sensors and the ESC control unit to establish whether one or more tyres are flat, by manipulating the angular velocity delta of the wheels. Automatic Demisting allows the Fiat 500X's Automatic Temperature Control system (ATC) to measure the humidity level inside the vehicle and automatically demist the windscreen without any intervention by the driver. Headlights switch on and off automatically depending on the exterior light and, when combined with the active safety system package, also offer the "Auto High Beam” function which switches main beam headlamps to dipped beam when another vehicle approaches. 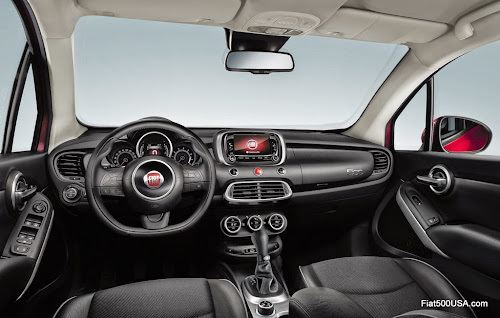 Fiat has always been a byword for innovative cars that offer sophisticated, yet simple-to-use technological solutions and content which satisfies a desire for top level connectivity and infotainment. The 500X crossover is certainly no exception, standing out in its category thanks to its latest generation Uconnect™ system and the exclusive BeatsAudioTM system, for a revolutionary on-board music experience. What's more, the 500X also features an instrument panel with reconfigurable 3.5" TFT display which allows the driver to customise the information displayed on the screen. Featuring a touchscreen system, Uconnect Radio LIVE 5" provides an extensive range of functions, starting with the Uconnect™ LIVE services offered as standard, as well as a host of music options, in addition to the FM/AM radio. The driver can actually connect his or her multimedia devices via USB or via the 3.5 mm auxiliary input (jack), or even stream music via Bluetooth from enabled smartphones. Digital radio (DAB) is also available upon request. You can also make and receive telephone calls hands free once you've connected your enabled smartphone to the Uconnect system using Bluetooth technology. The system can also read text messages on compatible smartphones. Finally, available upon request, the Uconnect RadioNav LIVE 5’’ navigation system with TomTom 2.5D navigator, voice commands and free TMC traffic alerts. Thanks to outstanding features such as the advanced lane indicator, drivers can easily navigate even the most complex junctions. The TomTom Routes function is the easiest way to calculate the fastest route, based on both current user speed data and permitted limits. And last but not least, drivers can travel in complete safety receiving “turn by turn” instructions on the instrument panel when other functions are active on the radio. Uconnect Radio Nav LIVE 6.5" features a 6.5 inch touchscreen, with large, easy-to-use icons. The Uconnect touchscreen system offers a series of functions, such as radio, music from multimedia devices, navigation, connected services and telephone functions. The functions and services available include the Uconnect LIVE services as standard, FM/AM radio and the option to connect multimedia players via USB or the 3.5 mm auxiliary port (jack). What's more, the driver can listen to music from an SD card or stream tracks via Bluetooth from an enabled smartphone. Digital radio (DAB) is also available upon request. The 3D map navigation system features “turn by turn” navigation and One Shot Voice Destination Entry to enter addresses using voice commands. The driver can also make and receive telephone calls hands free after connecting an enabled smartphone to the Uconnect system using Bluetooth technology. Finally, the system can read text messages and respond (using voice controls or the touchscreen) with one of a set of 18 pre-programmed messages. For the first time, Uconnect Radio LIVE 5’’, Radio Nav LIVE 5’’ and Radio Nav LIVE 6.5’’ are all offering the Uconnect LIVE services. Customers can download the Uconnect LIVE application from the Apple Store or Google Play Store on their smartphone. Simply connect your smartphone to the 500X to display and control a host of applications from the Uconnect touchscreen. The applications have been designed and adapted for use when driving to ensure drivers do not lose concentration, storing their smartphones in a pocket or the designated compartment. Uconnect LIVE will be released progressively in several European countries. With Uconnect LIVE, the user can access, directly from the 500X's touchscreen display, “TuneIn Internet”, online radio with over 100,000 stations from all over the world, “Deezer Internet music”, with over 20 million tracks, Reuters, to keep up-to-date with the latest news from all over the world and Facebook and Twitter, to keep in touch with their friends. On top of all of this, there's also eco:Drive, the first driving style app which allows you to reduce fuel consumption by up to 16% and reduce CO2 emissions by following real time advice. The Fiat 500X's eco:Drive mobile app is now connected via cloud for automatic driving data transfer. Finally, Uconnect LIVE allows direct access to my:Car, which offers real time alerts, servicing reminders and an interactive owner handbook to help drivers manage vehicle maintenance. When a smartphone is connected via Bluetooth, the most important alerts are automatically forwarded to the owner's personal Uconnect™ LIVE account, making managing maintenance easier than ever before. Uconnect Radio Nav LIVE 5’’ and Uconnect Radio Nav LIVE 6.5’’ include TomTom Live services with voice commands and reliable traffic information, to make every journey more efficient thanks to the Uconnect LIVE app. 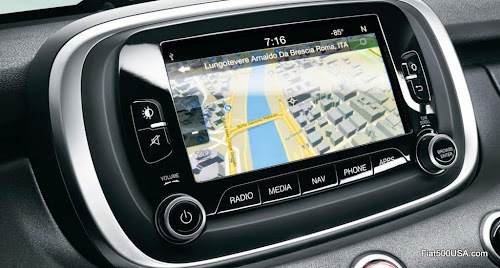 Fiat 500X drivers can now experience TomTom-connected navigation, which includes the world's most extensive source of traffic information, with over 100 million kilometres of traffic measurements gathered daily. Navigation systems are updated every two minutes with the latest traffic conditions. Using an advanced processing engine, Uconnect provides the quickest routes and the most accurate ETAs. As well as real time updates on traffic conditions, users also benefit from information on fixed and mobile speed cameras where available, the TomTom Search&Go local search service and real time weather forecasts. TomTom Live services include: Traffic (using real time traffic updates, the system gets the driver to his or her destination more quickly); Speed Cameras (indicates fixed and mobile speed cameras, helping drivers to stay safe and relaxed at the wheel); the TomTom Search & Go search facility (users can search by category or business name, from petrol stations to supermarkets, and navigate to their destination); and finally Weather (users can receive weather information for a given location and weather forecasts for up to 5 days, enabling them to plan their journeys with the most up-to-date weather). Owners of the new 500X can rest easy: their car is designed to adapt to the future, and offers the freedom to update Uconnect LIVE services with no need to replace the Uconnect system already installed. Uconnect LIVE services can be updated “over the air” when a compatible smartphone is connected via Bluetooth to the radio. Updates can be downloaded directly on to the Uconnect system, keeping the services up-to-date and allowing customers to continuously evolve their on-board connectivity experience. The Uconnect system is easy to understand thanks to a variety of user interfaces designed to allow users to choose the one they like best. For example, to control the communication, infotainment and navigation functions or the Uconnect LIVE services, users can use the steering wheel controls, the touchscreen display, voice recognition, the traditional levers and buttons or wireless technology such as Bluetooth. With so many options, users can adapt the technology just how they prefer. 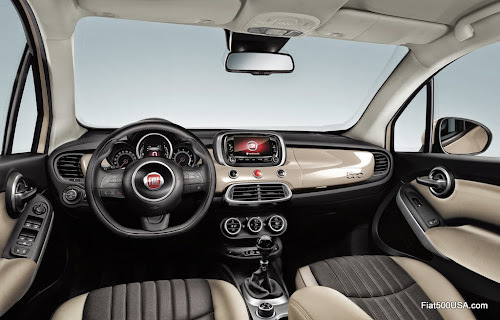 Depending on the Fiat 500X trim level, two audio systems are available: the first equipped with four speakers (120 watt), and the other with six speakers (180 watt). The new Fiat 500X 2015 also offers the latest audio experience from Beats by Dr. Dre, the system designed to revolutionise your on-board music experience. On request, customers can equip their vehicle with the exclusive BeatsAudioTM system - developed in collaboration with Beats by Dr.Dre. Specifically, the BeatsAudioTM system boasts a total power of 560 Watts and features an 8 channel digital amplifier which integrates an advanced equalisation algorithm designed to recreate the entire sound spectrum that an artist experiences during his/her studio recordings. The Beats Audio system includes an 8-channel amplifier for 560 watts of power, two dome tweeters in the dashboard, two 165 mm midwoofers in the front doors, two dome tweeters in the rear doors, two 165 mm midwoofers in the rear seats and a 20 mm - 15l subwoofer at the centre of the luggage compartment. The new Fiat 500X is produced at the updated SATA (Società Automobilistica Tecnologie Avanzate) factory in Melfi, which already houses the production lines for the new Jeep Renegade, the first Jeep to be built in Italy and produced outside of the United States for the global market. In preparation for the production of the new 500X and to guarantee the new vehicle the highest possible quality from the start, the SATA factory has implemented and aligned all the technology and the best practice of the other factories in the Fiat Chrysler Automobiles group. Today the complex comprises moulding, panelling, painting and assembly departments and employs a total of almost 6000 workers. 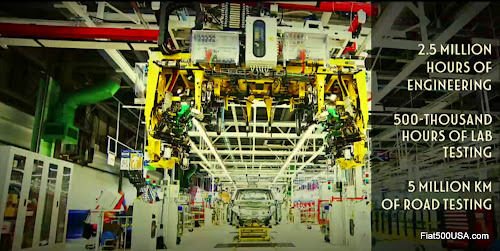 Spread over a surface area of around 1.9 million square metres, the plant was built in 1991 and the first vehicle left the assembly line in October 1993. Over the last 20 years, the factory has housed the production of various Fiat and Lancia models, such as the Fiat Punto (1994), Lancia Ypsilon (1995), new Ypsilon (2003), Grande Punto (2005) and Punto Evo (2009), producing a total of 5,645,275 vehicles by 2013. Every driver can find the Fiat 500X that best suits his or her needs and tastes. 2 versions are available at launch (one more “urban”, the other ideal for leisure use), 5 trim levels (Pop, Popstar, Lounge, Cross and Cross Plus), 3 engine options (140 HP 1.4 Turbo MultiAir II, 110 HP 1.6 “E-torQ”, 120 HP 1.6 MultiJet II and 140 HP 2.0 MultiJet II), 3 drive systems (front, front with “Traction Plus” system and four-wheel drive), 3 transmissions (five-speed manual, six-speed manual and nine-speed automatic), 12 body colours, 8 different alloy wheel designs (16”, 17 “ and 18”) and 7 different interior configurations. Below you'll find a description of the range destined for the entire EMEA region which, depending on the market, features some differences in content (standard or optional) in order to best meet the needs of the individual countries. To see the specific range for each country, visit your local Fiat Press website. The 500X range starts with the Pop trim level which, on the outside, features 16" steel rims with hub caps in gloss silver (16" alloy rims with gloss Dark Chrome effect are available on request) and body coloured front and rear bumpers. The front grille, the wheel arches and the side strips are black, along with the fairings on the electric heated door mirrors. Available in five exterior liveries, the version is topped off by chrome plated moustache and logo, light cluster frames and door and tailgate handles. The version also features a host of exciting content as standard. When it comes to safety, for example, there are two front airbags, two window bags and two side airbags in addition to the ABS with EBD, front headlights with DRL (Daytime Running Lights) function and the ESC system complete with the ASR, Hill Holder, MSR, DST and ERM functions. In the same way, the following are included as standard for maximum comfort: Cruise Control with speed limiter, electric front and rear windows, height-adjustable driver's seat and electric handbrake. The second trim level (Popstar) features 17” alloy rims with silver finish (17” rims with two-tone black paint or 18” rims with gloss silver finish available upon request), anti-fog headlamps and body coloured door mirror fairings. 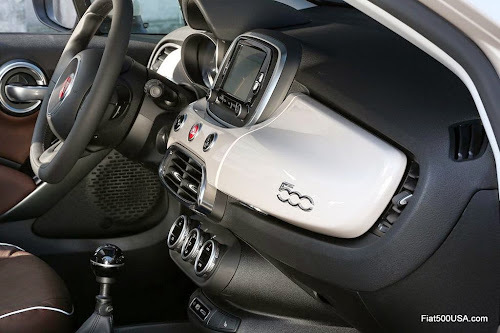 What's more, on top of the already rich content of the first trim level, the 500X Popstar adds manual climate control, Uconnect 5” Radio system, "Mood Selector" drive selection system and steering wheel with “Techno-leather” upholstery and radio controls. The customer also has a choice of 12 different body colours and two interiors. 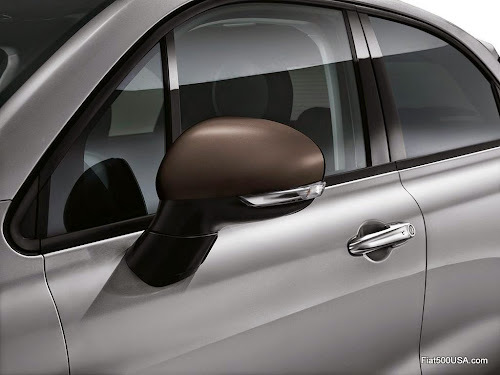 Even more exclusive, the 500X Lounge which, in addition to the content of the previous version, offers 18” alloy rims with gloss silver finish, tinted windows and exterior chrome trim. Designed to satisfy customers who care about comfort and technology, the 500X Lounge offers as standard Xenon headlights, Uconnect 5” Radio Nav, dual zone climate control, instrument panel with 3.5" colour TFT display, tinted windows, ambiance lighting and the “Keyless Entry & Keyless Go" system. All topped off with exclusive fabric and eco-leather interiors. The “off-road” calling of the 500X Cross is clear, demonstrated by its specific bumpers and protective skid-plates which increase the ramp angles. This version comes as standard with front-wheel drive and the "Traction+" system (4x4 drive available upon request). The Cross trim level also features a specific treatment on the roof bars, two-tone 18" alloy rims, a chrome plated exhaust pipe and an exclusive satinised chrome finish on the door handles, light surrounds, front moustache and tailgate handle. Also included as standard, manual climate control, Uconnect 5” Radio system, "Mood Selector" drive selection system, fog lights, body coloured fairings on the electric heated door mirrors, tinted windows and steering wheel with “Techno-leather” upholstery and radio controls. For those who want the maximum in terms of style and content, check out the 500X Cross Plus, the top-of-the-range version which, in addition to the specific off-road features of the previous version, offers 18" alloy rims with two-tone finish (18" rims with specific design available upon request), Xenon headlights, the Uconnect 5” Radio Nav system, dual zone climate control, instrument panel with 3.5" colour TCT display, ambience lighting and the "Keyless Entry & Keyless Go" system. Finally, depending on the market and trim level, numerous optional extras and accessories are available. For the customer's convenience and to save on cost, these can also be purchased in specific Packs. 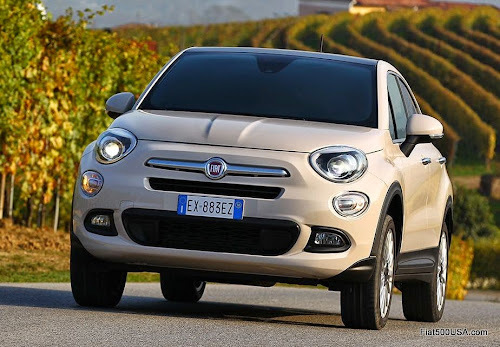 The new Fiat 500X is set to arrive in dealerships from early 2015, and like any cult item, initially it may be tricky to meet demand. For this reason, the brand has created an exclusive, top of the range, limited edition of the model - the Fiat 500X “Opening Edition” - to guarantee the first 2000 lucky customers the chance to drive the exciting new crossover from the 500 family. Two exteriors - like the two souls of the new 500X: one more "urban" in Art Grey, the other in tri-coat red, perfect for recreational use. To find out more about the exclusive Fiat 500X “Opening Edition”, users can visit www.500X.fiat500.com to discover what makes the new Fiat crossover truly one of a kind, using a navigation system which allows you to explore the car from any angle. On the website you can also reserve your limited edition Fiat 500X through your trusted dealership and be one of the first 2000 to drive one. On the markets on which it will retail - Italy, Germany, France, Spain, and Switzerland - the Fiat 500X “Opening Edition” will be available in three configurations: two 4x2 options with the 140 HP 1.4 Turbo MultiAir II or the 120 HP 1.6 MultiJet II engines, and one 4x4 with the 140 HP 2.0 MultiJet II engine. The 500X "Opening Edition" with 4x2 drive system - equipped with the 120 HP 1.6 MultiJet II engine or the 140 HP 1.4 Turbo MultiAir II - features a pastel Art Grey livery, and an exclusive selection of equipment such as automatic climate control, 18" alloy rims, the "Safety Pack" which includes a comprehensive range of active safety systems (anti-collision, a lane change assistance system to get around blind spots, a lane departure warning system, a rear camera for reversing), as well as the “Comfort Pack" to ensure optimum on-board comfort (armrest and lumbar adjustment) plus the Keyless Entry & Keyless Go system, tinted rear windows and the exclusive Opening Edition badge. The second version comes in exclusive tri-coat Amore Red, and boasts 4x4 drive system with a 140 HP 2.0 MultiJet II engine plus 9-speed automatic transmission. The top of the range equipment on this model is sure to attract attention. As well as a host of features as standard, the purchase price also includes a wealth of exclusive content, from the special tri-coat Amore Red paint, to the "Navi Pack" (Uconnect 3D Nav 6.5" with additional USB port on the front armrest compartment), plus two-tone red and black leather interiors, "Visibility Pack" with rain and dusk sensors, electrically folding door mirrors, an electrochromic rear view mirror, steering wheel gear controls and the exclusive Opening Edition badge. 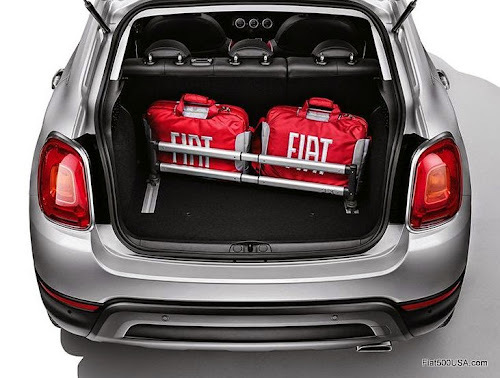 Transforming your car into a unique, personalised item: that’s the aim behind the exclusive collection of dedicated Fiat 500X accessories and services created by Mopar®, the reference brand for Services, Customer Care, Original Spare Parts and Accessories for Fiat-Chrysler brands. Over 100 accessories have been designed specifically for the Fiat crossover, all top-quality products which perfectly match the technical and stylistic features of the new car for full, complete customisation. Examples include the 18" alloy rims with their specific design and range of colours and aesthetic treatments, the door mirror fairings in 9 colour options, original stickers for the roof, bonnet and side strips, and door moulding inserts in four colours or chrome plated. For a splash more colour, there are four kits available (White, Red, Bronze and Greyge) comprising mirror fairings, door moulding inserts and roof/bonnet stickers which perfectly match the alloy rims. Or, for those who prefer something a little more stylish, there are a host of chrome plated elements to choose from - available individually or in the excellent value Chrome Kit - such as mirror fairings, door moulding inserts, fog light trim and bonnet moulding. Enhancing the 500X's functionality are a wide range of roof boxes and systems for transporting winter and water sports equipment (bikes, surfboards, skis, snowboards, etc.). The offer is completed by a selection of accessories dedicated to protecting and getting the most out of the luggage compartment (guards, nets and organisers) or for increasing comfort inside the vehicle (such as tablet holders and coat hooks). "Mopar Vehicle Protection" offers a complete portfolio of service contracts guaranteed by Fiat Chrysler Automobiles, which ensure the utmost peace of mind for customers thanks to a wide range of warranty products to cover the vehicle's electrical and mechanical components, dedicated servicing plans designed to meet specific customer needs, in addition to an assistance and repair service provided by highly specialised technicians who use exclusively original parts. Currently available in more than 40 countries in the EMEA region and with a portfolio of more than 50 products, "Mopar Vehicle Protection" has developed a specific selection of assistance and maintenance services - known as "Xtra Care" - to meet the needs of the new Fiat 500X customers. The proposed solution puts the stress firmly on coverage for mechanical and electrical faults – extending the manufacturer’s warranty up to five years / 75,000 km – and includes, for the same period, cover for scheduled maintenance costs to guarantee a vehicle which is always in perfect condition. “Mopar Vehicle Protection” plans include a comprehensive range of options in terms of duration and mileage, designed to offer customers greater protection for their vehicles, providing the certainty that, wherever they may be, they can always count on a widespread service network which makes use of original parts and highly qualified technicians. In addition, all the peace of mind provided by roadside assistance services throughout Europe and all the value of a plan which, if the vehicle is sold on, can be used by its new owner. 500X customers will have access to a new Owner Handbook containing comprehensive vehicle information in just 200 pages. Featuring a full colour layout that's quick to consult and user-friendly, the publication is accompanied by addition information available online or via “Ciao Fiat Mobile”, the mobile application available free of charge from the Apple Store and Google Play in 15 European countries and in 5 languages, downloaded more than 125,000 times up to September 2014. The new 500X Owner Handbook will also offer an Augmented Reality function: simply scan the "AR+" symbol inside the handbook and direct your smartphone camera at given parts of the car to access additional interactive content. With the launch of the new 500X, the activities of Technical Service – provided by Mopar through the Service Network of Dealerships and Authorised Workshops and Body Shops – have also been updated to offer a service that always keeps pace with technological innovation. For instance, the sales launch of the 500X sees the debut of the microPOD at servicing centres. This is a new, totally wireless, electronic diagnosis tool. Finally, Mopar Technical Service organises targeted courses for all roles in the network, assessing and certifying various skills. A wide-ranging and varied task, and – for the launch of the new 500X – this too has been updated in terms of processes and procedures to make training another pièce de résistance of the Mopar brand.